00:10:00 Makes 4 servings, 1 cup each. This Asian-style rice salad is anything but ordinary. Made with grilled steak, cooked rice and crunchy veggies, this Thai Pepper Salad makes for a fast and fresh main dish salad. 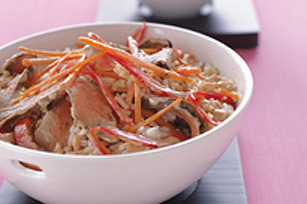 Toss steak, rice, peppers and carrots in large bowl. Mix Miracle Whip, soy sauce and barbecue sauce until well blended. Spoon over salad; toss to coat. Miracle Whip and Kraft Original BBQ Sauce are the secret ingredients that make this salad flavour packed. Visual show single serving of salad on plate with fork, with strips of grilled sirloin steak on top with garnish of coriander. For added flavour, garnish with 1/4 cup chopped fresh coriander and 1 Tbsp. finely chopped fresh gingerroot. Excellent source vitamins A, C, niacin, B6, B12, zinc, good source thiamine, phosphorus and iron. Serving Size Makes 4 servings, 1 cup each.